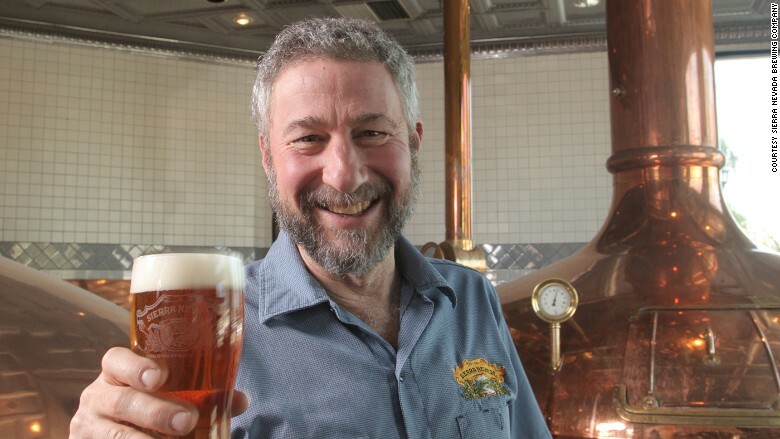 Ken Grossman is the founder and CEO of the Sierra Nevada Brewing Company. Ken Grossman is living the dream. He turned his home brewing hobby into an international business, making a fortune along the way. Since bottling its first Pale Ale in 1980, Grossman's Sierra Nevada Brewing Company has grown into the third largest craft brewer in the United States, and the seventh largest beer producer in the country. His personal wealth is now estimated at $1.1 billion, according to Forbes. Schooled in the art of making beer from an early age, Grossman's first taste of business came in his early twenties when he opened a home brew store in Chico, California in 1976. His own beers soon caught people's attention. Three years on, he launched Sierra Nevada Brewing, named after his favorite hiking spot in the nearby mountains. Back then, large breweries dominated the U.S. market, producing mainly lagers. "In 1980, there were roughly 45 companies making beer," Grossman says. "It was pretty much the low point in the U.S. brewing industry after prohibition." Since then, the U.S. craft beer scene has exploded. Read: There's a bull market for ... beer! There are now more breweries in the U.S. than ever before, and annual craft beer retail sales are worth about $22.3 billion, or roughly 12% of the market. The number of breweries operating in the U.S. grew 15% in 2015, with 620 opening and 68 closing, according to the Brewers Association. And Sierra Nevada has seen growth to match. It now produces 1.2 million barrels of beer annually from its two breweries. Last year, it brewed nearly 200 different beers (most were small-batch, draught-only releases) and sales grew by 17.3%. But its flagship Pale Ale still tops the charts, accounting for 49% of total sales. "It's a fantastic beer and I drink it regularly. I always enjoyed that style of ale," says Grossman. Now 61, Grossman is a hands-on CEO, tasting new beers and working with a team of scientists designing and tweaking new recipes. Innovation aside, Grossman thinks it's his firm's commitment to tradition and high quality that keeps it growing. "We maintain very much our original roots as far as what we brew and how we brew it," he says. "It has obviously grown over the years, but we still maintain the same principles that we started with. I think the consumers and our peers respect that." Sierra Nevada is expanding globally, and the brand is already popular in the U.K., Australia and Italy, Grossman says. "The demand is there and we are increasing substantially in that area." And even after all these years, he hasn't lost his passion for brewing. "I love the alchemy, the science, the flavors, the creativity," he says. "There's just so much to like about making beer."